My first completed 3d model, though not my first freebie. 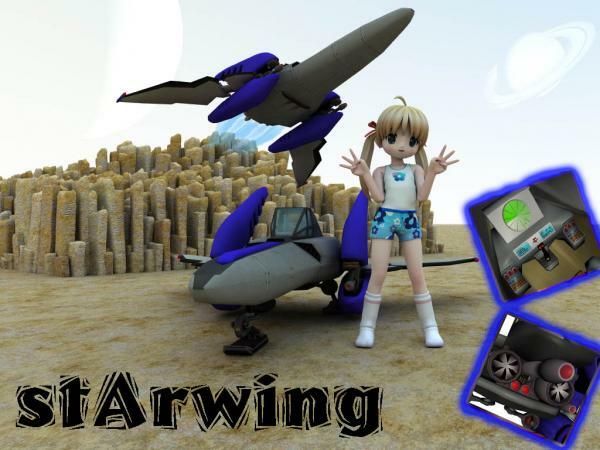 Modelled after the Arwing from the Star Fox video game series. I must apologize for the textures. I am learning alot about Photoshop in the process, but to be honest I would rather model than texture, and this model shows that. On the plus side, I add UVMaps to all my models in hopes others make some textures for them. Even with the textures I made, it renders nicely in Vue and in DAZ. I did the renders above in VUE and the lil pip-images in DAZ. In poser there are a few quirks in the viewport with the textures that does not show up in renders. Not sure what is up with that. If you want to use the geometry, please include "Modelled by Rj Cain", or something like that, somewhere, and possibly a link back to where you found it. Richard79 (1 year ago) Inappropriate? Who is the character, or what is the model called? Eastern Fox (4 years ago) Inappropriate? sry for the waaaay late reply wickedelf, have not been modelling for awhile... got bummed after my exteral drive died with all my stuff on it. Textures are always welcome for any of my models. I try to make them as texture maker friendly as possible. If you are using poser, you can select the Window drop down menu, then select Hierarchy Editor. In there under Canopy Select Canopy Glass, then you can see the dials to adjust the Canopy Glass. U can also edit the CR2 to have the dials always show. if you open the Landing Off.pz2 found in the pose folder for this model, you will see that it is very easy to make a pose file to hide any body part. ...and yeah, the glass and the canopy are two seperate models. I did this before I realized I could use multi-materials in Poser/Daz, and like a doofus I never reverted the glass back into the canopy mesh, like I more …if you open the Landing Off.pz2 found in the pose folder for this model, you will see that it is very easy to make a pose file to hide any body part. icrazycarl (11 years ago) Inappropriate?